Berwick Record Office's next event is on Friday 11 March 2011 at 7.30 pm following the annual general meeting of The Friends of Berwick and District Museum and Archives at 7pm. Paul Carter (National Archives, London) will be talking about lessons learnt on the Workhouse Project. Berwick Workhouse was included in this recent project which has enabled correspondence concerning various workhouses throughout the country to become available on the internet. It's not easy to find, however you can search for Poor Law Correspondence for Berwick by entering 'Berwick'. Everyone is welcome to attend this free talk ! It's at Berwick Parish Centre, The Parade, Berwick-upon-Tweed, TD15 1DF, England. Map. It's next to Holy Trinity Church. Entrance is through the churchyard. The suggested car parking is near the Barracks and Wallace Green. Ancestry have just announced that anyone can search the enhanced indexes to the 1910 United States Census (the thirteenth census) for free until 21st February. Search 93 million improved records from all 50 states, Washington, D.C. and Puerto Rico, plus U.S. Military and Naval Forces." 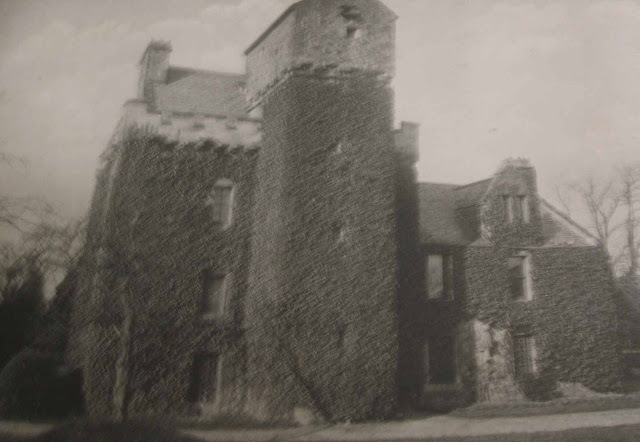 A few weeks ago, I was shown several interesting items including two scrapbooks with old photographs and prints of Jedburgh Abbey, photographs of the Jedburgh Rambling Club in Edwardian times, the Proclamation of George V in the Market Square, Jedburgh, 1910, a particularly nice photograph of Darnick Tower (which unfortunately doesn't scan well), and the Thomson bi-centenary at Southdean on 8th September 1900 – all these photographs have people who could be recognisable, and almost all of them are unfortunately identified; another scrapbook, contains cuttings from various Border newspapers from 1862 to 1887, together with his comments and copies of letters. The last item was a small book of 69 pages that I haven’t seen before; The Scottish Border: A Memorial of Her Majesty’s Visit to the District, August 1867, published by Rutherfurds of Kelso in 1867. On 20th August 1867, Queen Victoria left Windsor Castle, accompanied by Prince Christian of Schleswig-Holstein and his wife (Victoria’s daughter, Princess Helena), and their infant son, 3 other children of Victoria, Princesses Louise and Beatrice, and Prince Leopold, to visit the Duke and Duchess of Roxburghe at Floors Castle on her way to Balmoral. It describes the scenery and associated history from Carlisle, to Hawick, and in and around Kelso. There’s a detailed description of the inside of Floors Castle. Most people came into Kelso about 6 am on 21st August and waited for procession to start from Shedden Park at 8 am. It names the dignitaries, the occupants of windows overlooking the Square. The Royal train arrived at 11.15 am, and of course, there were speeches and music. The next day, the Queen visited Melrose and Abbotsford via welcoming crowds in Maxton, St Boswells, Newtown St Boswells, and Newstead; the day after, she visited Jedburgh, via Heiton and Eckford.